Swiss Re Ltd, the Group’s holding company, is a joint stock company, listed in accordance with the International Reporting Standard on the SIX Swiss Exchange (ISIN CH0126881561), domiciled at Mythenquai 50/60 in 8022 Zurich, and organised under the laws of Switzerland. Information on its market capitalisation is provided in Share performance of this Financial Report. No other Group companies have shares listed. 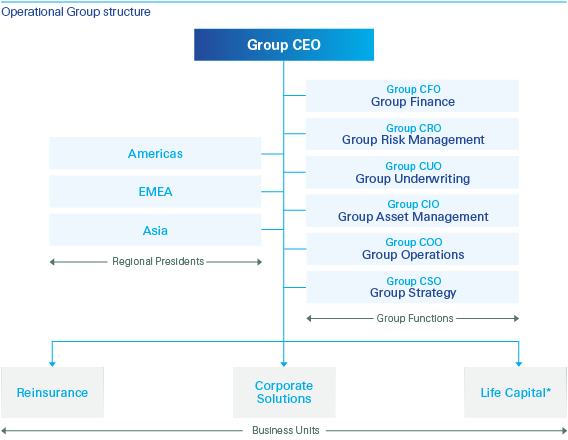 More information on the Group companies is provided in Note 19 to the Group financial statements. Swiss Re Ltd has a level I American Depositary Receipts (ADRs) programme in the US. The ADRs are traded over the counter (ISIN US8708861088, OTC symbol SSREY). Following a split in 2015, one Swiss Re Ltd share equals four ADRs. Neither the ADRs, nor the underlying Swiss Re shares, are listed on a securities exchange in the US. * Since 1 January 2016 Admin Re is part of the Business Unit Life Capital.